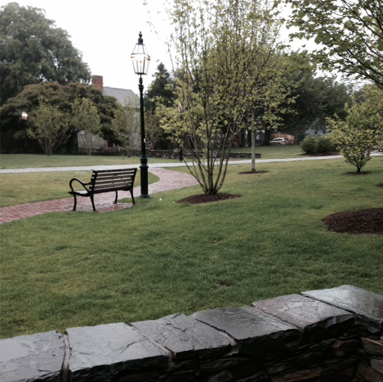 Since the completion of Queen Anne Square, it has been a visual center of the city – it celebrates the architectural heritage of Newport and gives residents and visitors alike an open space in which to share an experience of the past. The park design centers on three stacked stone foundations, which represent actual locations and footprints of buildings which existed on the site during three different centuries: 1777, 1876, and 1907.
represent actual locations and footprints of buildings which existed on the site during three different centuries: 1777, 1876, and 1907. The Meeting Room was designed by artist Maya Lin in collaboration with Edwina von Gal and Nick Benson.